From California to South Yorkshire; from Ireland to faerie land; from tai chi to chai latte – for a small folk /roots festival in only its fifth year, a wide range was on offer. Underneath The Stars has the celebrated folk singer-songwriter Kate Rusby as its figurehead (no passive figurehead, mind! ), but the whole Rusby family are involved in its production – for example, siblings Joe and Emma are both active directors, each with their own key roles. Family values are much to the fore with many child-friendly activities, but I found you don’t need kids in tow to get a lot out of a weekend here. As Kate is an ardent champion of South Yorkshire and Barnsley in particular, you might have expected the wealth of talented local artists that were appearing over the weekend. But your world atlas would be well stickered if you were to flag the homes of all the international artists also on the bill. A global outlook was also prevalent on environmental responsibility, applied with Yorkshire pragmatism. Kate has previously said “being fair, inclusive and sustainable has always been a priority for us”; and this ethos seemed to be enthusiastically embraced by all the traders, exhibitors, workshops and an army of ‘Star volunteers’. The pride and commitment of the volunteers was exemplified by a pair I chatted to, who were very insistent – with their litter-clearing tools in hand – that I didn’t forget to report that it was the tidiest festival anywhere! Which I’d have to admit it probably was. This year the festival has a new location at Cinderhill Farm, near Barnsley. It was refreshingly easy to get onto the site when I arrived on Friday afternoon. No car queues meant I was soon parked on the campsite and pitching my tent. Not much orientation needed, given the festival’s compact, ‘boutique’ nature, so I could head straight to the event arena for the last few acts of the opening day. Inside the arena there were two main stages, the Planets Stage and the Little Lights Stage, both in large tents, plus a sprinkling around them of smaller satellite tents and stalls offering various wares, workshops and other wonders. First surprise – FULLY SEATED IN MAIN TENT! Later that day, Kate Rusby tells me that one of their guiding principles has always been to provide higher levels of comfort than are normally found at festivals. At the Planets Stage I was eased nicely into the weekend’s music by the modestly sophisticated Estbel, who are two Estonians and two Belgians (Est+Bel – geddit?). Lovely vocals were accompanied by accordion, guitar, fiddle and fully electric bagpipes; different personalities were portrayed neatly in their penultimate number, ‘Kalev & Linda’, which married to great effect one gentle tune to another more rocking one. You can hear this and more from their endearing set on debut studio album ‘Saar’. I’m afraid the jazz-funk-soul of Scottish group Fat Suit on the Little Lights Stage next was not quite to my taste, but they seemed to go down well with the rest of their audience. Closing the same stage later that night, Howlin’ Ric & The Rocketeers kept the party going right up to arena curfew with their full-throttle Leeds-based take on early rock ‘n’ roll; all smart vintage instruments and fifties attitude. The booking coup for day one (nice one, Joe Rusby!) 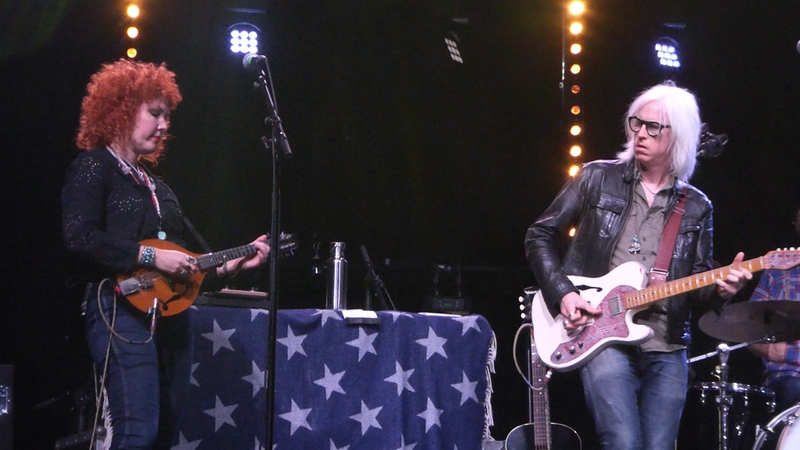 was Steve Earle & The Dukes and they were firing on all cylinders. I love the latest album, ‘So You Wannabe An Outlaw’, and the set opened with the title track, then featured a good few others from that LP, including ‘Lookin’ For a Woman’, ‘The Firebreak Line’, ‘Ain’t No God in Mexico’, ‘If Mama Coulda Seen Me’ and my current favourite, ‘Fixin’ To Die’, its raw energy making me think of, as others have commented, ‘When The Levee Breaks’, but also of the headlong dash of ‘Helter Skelter’. 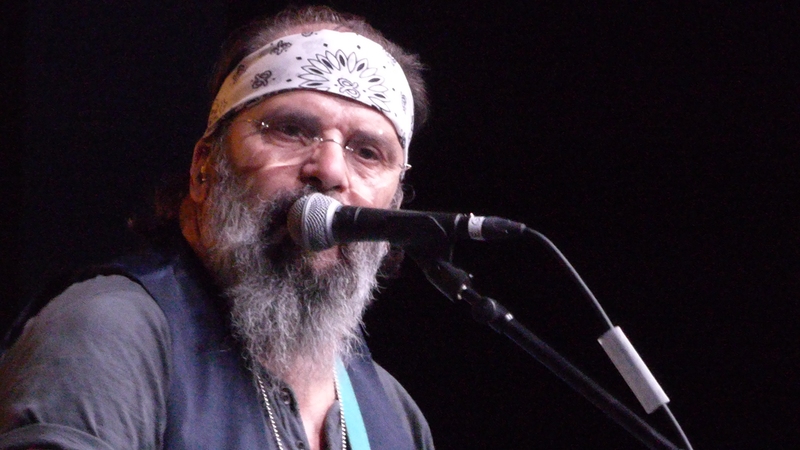 ‘Copperhead Road’ naturally got the crowd all fired up and reinforced Steve Earle’s claim back then to have delivered the world’s first blend of heavy metal and bluegrass. ‘My Old Friend The Blues’ and ‘Jerusalem’ were also aired. I want to salute the mighty, mighty Dukes: Brad Pemberton on drums, Ricky Ray Jackson on pedal steel, long-serving Kelly Looney on bass, Eleanor Whitmore on fiddle, vocals and keys and Chris Masterson on guitar – these last two also happening to be married to each other and a separate act in their own right, The Mastersons. Chris’s stellar guitar was, as to be expected, prominent in the band’s cover of ‘Hey Joe’ that ended the main set, and Steve led an impassioned take on ‘The Revolution Starts Now’ as an encore. Felt like too short a set, but that’s probably the mark of a great show. Day two began with an ironically stressed and hurried rush down to the main arena to make sure I was in time for a calming tai chi workshop with David Lipka to start my morning – and thankfully it worked. Just the ticket post tai chi, was the beautiful voice & charm of Kizzy Crawford caught in soundcheck as well as in her full set to open the day’s music on the Little Lights Stage. Later, something completely different on the Planets Stage – ‘The Adventures of Andy Kershaw’. His slide show illustrated recollections from his wide journalist and broadcasting career, which brought many memories back for me, including Whistle Test, Peel and The Clash in their prime. It was fascinating – and often funny – to hear about all that and more from the well-travelled perspective of this “follower of fashion” (a joke he made at his own expense when a series of photos taken many months and many miles apart all showed him sporting the same tee-shirt). Andy was followed next by the crystal voice of Martha Tilston, back on the Little Lights Stage. Opening song, ‘Survival Guide’ nicely signalled from the start both her musicality and the concerns that preoccupy her (“Survival guide to my children; the world is getting tough, you’d better grow your spirit tall”). The main acts were timetabled to run across the two stages with no overlaps, so that you could, if you wanted, see all of them with none of the clashes and what-act-do-I-choose-now dilemmas you can get at other festivals. This also clearly helped with stage resets and gave time for all the artists to have more pre-show soundchecks than would be possible on other festival stages. It did risk at times feeling a bit too linearly sequential; a bit like we were being subtly shepherded back and forth en masse between the two stages. But it was always possible of course to break out – perhaps to eat, drink or shop, and I certainly spent a good chunk of time (and money) in the tent selling vinyl, CD and other merchandise by artists appearing at the festival, many of whom would also appear in that tent after their performances to sign their merchandise and chat to folks. Another happy diversion from oscillating between the Planets and Little Lights Stages entailed following your ears until your eyes could be similarly treated with the sensory overload that was the roving Frumptarn Guggenband. Guggen music is a glorious, carnival style of brass and percussion which originated in Switzerland, but this colourfully costumed, skull head geared and face-painted lot are from the town of Barnsley – say their name aloud in a Yorkshire accent and you’ll get it! Infectious fun and they had me as soon as they played ‘Papa’s Got a Brand New Pigbag’. Back to the stages and a late afternoon feast of banjos, banjos, and more banjos. Just as well I like the sound of the banjo then. One day after the release of album ‘Banjophony’ we were treated to a banjo-tastic world premiere performance by Damien O’Kane (Mr Kate Rusby, as it happens) and Ron Block (long-time collaborator with Alison Krauss). They merge Irish and American bluegrass banjo traditions and, bolstered by their band on stage they are irresistible. Virtuoso banjo work by this pair, but not so much duelling banjos as comrades-in-arms banjos. And a bit of The Muppet Show theme thrown in for good measure. I love John Metcalfe’s orchestral arrangements on Peter Gabriel’s albums, ‘Scratch My Back’ and ‘New Blood’, but I also like his own work, including long number ‘Sun’ from ‘The Appearance of Colour’. So I was surprised to find I just couldn’t engage with his show on Saturday evening. Maybe it was his minimal chat with the audience; maybe it was his choice of a long, gently building opening number; but I wasn’t the only one feeling disconnected. Unfortunately, the crowd originally gathered in the Little Lights tent for his show start visibly thinned to maybe a half during the course of that opener. I had to leave before the end of the set too to do an interview with Lau (more on them later), but even without that to go to, I may have found my attention wandering and then my feet. The full, mad range of live Lau was the highlight of day two for me. 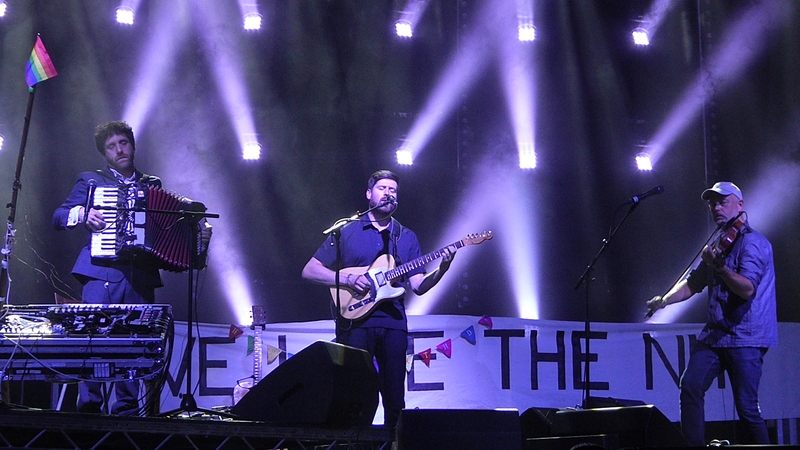 On the face of it, they are a fairly traditional acoustic folk combination of vocals and guitar from Kris Drever, vocals and fiddle from Aidan O’Rourke, accordion from Martin Green, and dry wit from all three. That they are masters of their instruments and art elevates Lau for starters. That electronic elements are then added to the mix by all three musicians sets Lau apart even more. Finally, enter MORAG (I capitalise, à la Premium Bonds’ ERNIE and HAL 9000 from ‘2001: A Space Odyssey’), and Lau’s electronic folk hybrid becomes utterly unique. MORAG is apparently a “semi-sentient self-organising sonic system” that has evolved over the last decade and is primarily attended to on stage by Martin, though at times all three are involved. “We don’t claim to control her, we just offer her gifts of noise – and she responds in different ways, depending on her temperament”. The result is layers of bass, rhythm and other more exotic electronica added to Lau’s mesmerising music and given full rein during the two longer pieces that their set gravitates around. As a side effect, I also discovered MORAG to be an antihistamine, as my hay fever cleared up for the first time in hours during a MORAG-heavy section. The great thing with Lau is that they can also deliver equally powerful numbers without MORAG being so prominent, as in ‘Noltland Castle’, ‘Sea’, ‘Save The Bees’, ‘Ghosts’, ‘Far From Portland’; including a simple acoustic close of their set, with Martin, Kris and Aidan clustered around a single mic at the front. The ‘folk-hop’ of Honeyfeet picked up after the Ukes and closed the day’s proceedings in riotous party fashion on the Little Lights Stage. For me, though, day two was owned by Lau. The group also gave me an interview in which they discussed their plans for a new crowd-funded album, ‘Midnight & Closedown’ to be produced by John Parish, and their upcoming curated programme ‘Lau-Land’, at the Edinburgh Festival on 18th August. That interview will appear on this website soon. Following the previous day’s template, I started day three with another morning tai chi session, then caught the captivating vocals of Amythyst Kiah in soundcheck and in her full set on the Little Lights Stage (including a great cover of ‘Jolene’). Next was local ‘Chocolat’ author, Joanne Harris, appearing on the Planets Stage. Accompanying her readings was music played live by the #Storytime Band, with Joanne joining them in song or on flute. Atmospheric illustrations and photos were projected on screen, and, against the odds, a big tent on a balmy Sunday morning in Yorkshire turned into quite the most natural setting for tales of faerie worlds, wronged lovers and magical revenge. Many of the stories had originated on Twitter – hence the hashtag with Storytime – and those tweeted stories always began the same way – “There is a story the bees used to tell, which makes it hard to disbelieve….” The stories and music gelled perfectly, and at times, with the keyboard and flute elements, evoked the pastoral fantasies of classic early Genesis. Further diversions from the two main stages maintained a sense of the magical. The ‘Playground of Illusions’ presented a striking collection of weird contraptions and optical trickery that you could physically interact with. And later when the sun was casting long shadows I found myself drawn to the ‘Pendulum Wave Machine’, a mechanical installation that initially looks like a giant version of that old desktop toy, Newton’s Cradle. 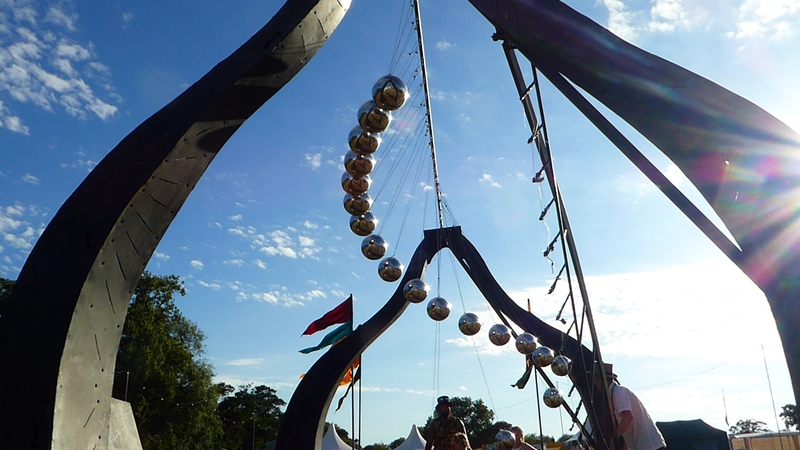 However, once the structure was primed and the big steel balls were released, they went through a 70-second cycle of constantly alternating patterns of order and chaos – including at one point forming a double helix. Describing it does no justice to the hypnotic motion, but the decades were rolled back for me, watching and rooted to the ground like a fixated five-year-old – wonderful! Or ‘mathemagical’ as they described it. Back to the music. 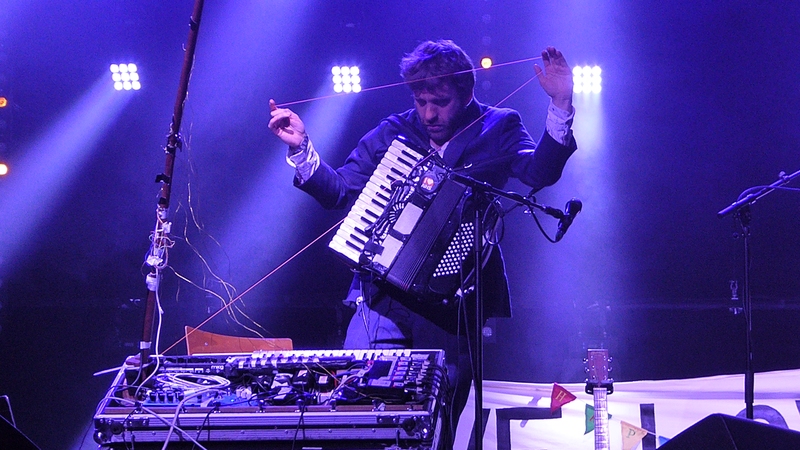 Yves Lambert is credited with reinvigorating and bringing new fans to the Quebecois folk scene. On the evidence today of his energy, passion, charm and virtuosity, the man shows no sign of easing up on his 40-year career and will no doubt continue to win new fans to this music. 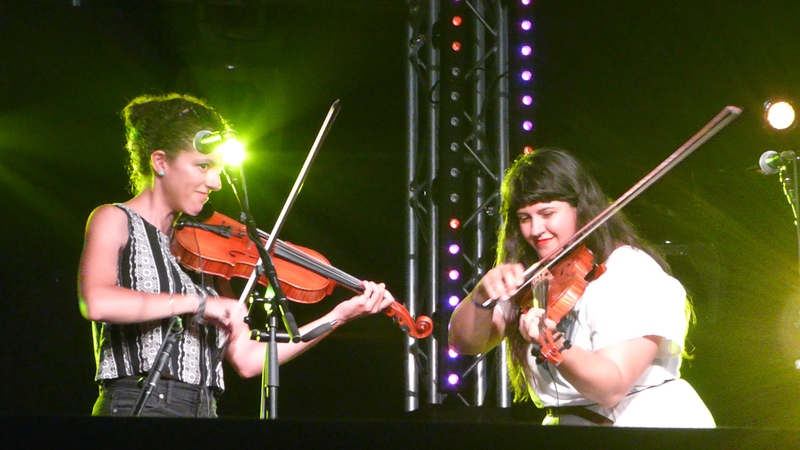 Festival highlight number three: Laura Cortese & The Dance Cards were a sparkling cocktail of intertwined strings, vocal harmonies to swoon over and hearts-on-the-sleeve openness. American roots music, richly suffused with sophisticated songwriting and spot-on arrangements. And again, those close harmonies – out of this world. I’d interviewed Laura earlier (fuller feature to appear on this website soon), and had been struck by the values and principles underpinning her whole approach. Meaningful connections, stronger communities, greater well-being in society, the value of travel – all brought out in her lyrics and music, but seemingly also imbued in her whole way of being, from onstage performance to backstage answers to a hack’s prying questions. Overlaid with a neat sense of humour. With Laura Cortese on fiddle, The Dance Cards are Valerie Thompson on cello, Sumaia Jackson on fiddle & banjo, and Hasee Ciaccio on upright bass. There are a smattering of UK dates left if you want to see them before they head back across the Atlantic. 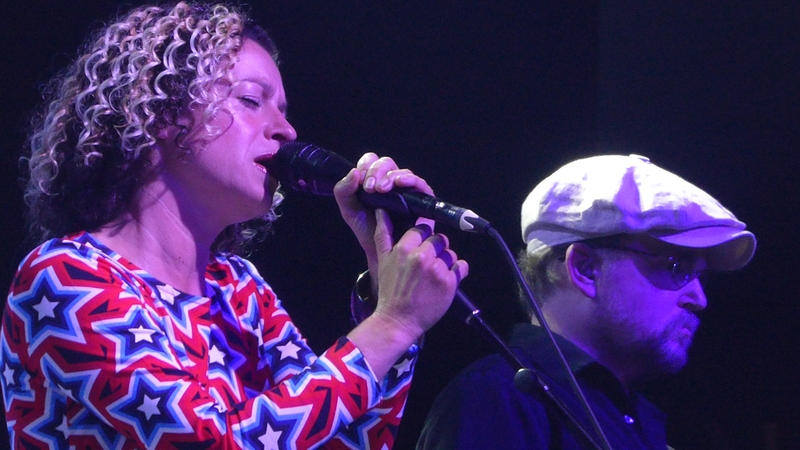 Kate Rusby of course will never be anything but magnificent on home turf with family around her. Resplendent in a bright starry dress, she began her set with one of my favourites of hers, ‘Benjamin Bowmaneer’ from gorgeous album ‘Life in a Paper Boat’. Other songs played from that album tonight included ‘Only Desire What You Have’, ‘Hunter Moon’, ‘Pace Egging Song’ and ‘Big Brave Bill’ – which managed to deliver a surprise for Kate herself, as a member of the audience charged into view in full Big Brave Bill superhero costume. As the show went on, various guests and family members joined Kate on stage (husband Damien O’Kane is part of the band anyway). 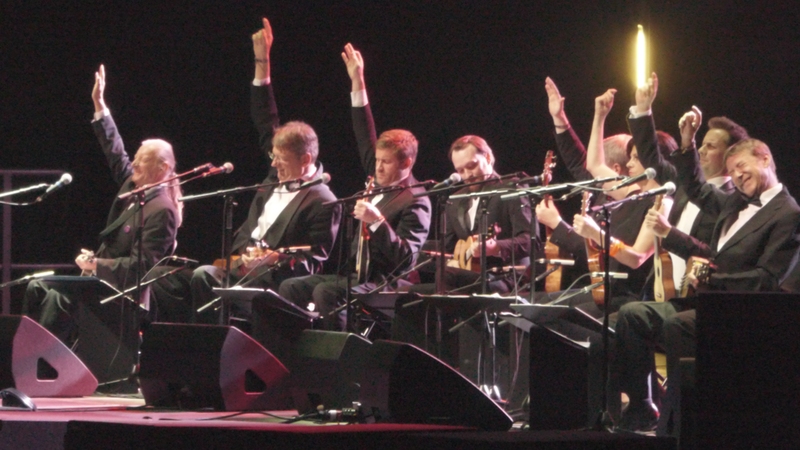 This included Jason Manford at one point, who sang with Kate on ‘Falling Slowly’ from ‘Once’. Childhood friend Sally Smith joined on second whistle for a bit of fun on ‘I Courted a Sailor’, and Ron Block joined for Damien and him to reprise a bit of their banjo performance from Saturday. The stage filled with family and friends for ‘Blooming Heather’, and as people started to file out at the end, Kate gave us a short a cappella version of her song, ‘Underneath The Stars’ which also gave its name to the festival. A lovely celebratory set, by the lovely and celebrated Ms Rusby – celebrated tonight by a very full Planets Stage marquee indeed. Over on the Little Lights Stage, The California Feetwarmers had the unenviable task of following Kate Rusby’s set to provide the final set of the weekend. Despite these challenging circumstances, they drew a good appreciative crowd for their authentic take on classic New Orleans band music circa 1920. Recapping on festival highlights: Steve Earle & The Dukes outlaw-rocked and stole the day on Friday; Lau’s lunatic melange of electronic folk was utterly unique and mesmerising on Saturday; and on Sunday, from two different traditions and opposite sides of the Atlantic, Kate Rusby and Laura Cortese and the Dance Cards showed the power of beautiful voices integrated with perfect arrangements. “Cleanest festival, ever”, boasted one of the volunteers, but the superlatives aren’t limited to the running of the festival – that was a weekend supernova of arts, activities, folk and roots music, and I’ll start the countdown now to it orbiting round again next year.